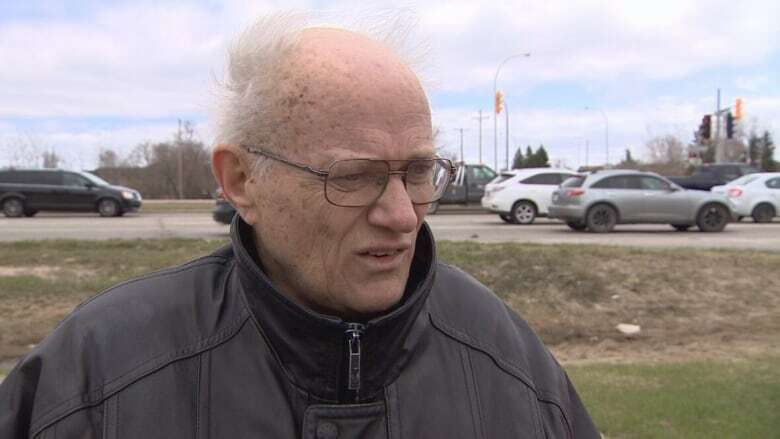 A Winnipeg senior is challenging a red-light traffic ticket in the coming weeks with the help of a forensic traffic engineer. He hopes they will be able to convince the courts that Winnipeg's four-second yellow light is too short for 80km/h roadways. Is it reasonable to expect a driver travelling at 80 kilometres per hour to safely stop at a controlled intersection with a four-second yellow light? This question will form the basis of a Winnipeg man's defence in the coming weeks in traffic court. In October of 2015, James Aisaican-Chase, 71, was returning home from a doctor's appointment heading westbound down Bishop Grandin Boulevard approaching River Road — an 80 km/h zone — when the light turned yellow. The Winnipeg senior said that he did not think he had enough time to stop safely, so he kept going. He entered the intersection 0.29 seconds after the light turned red, resulting in a $200 ticket. Aisaican-Chase, who is battling terminal cancer, gave his testimony for the upcoming trial last spring — since at the time his doctors estimated he had only three months to live. The trial was originally supposed to take place on Wednesday, but has now been temporarily postponed. 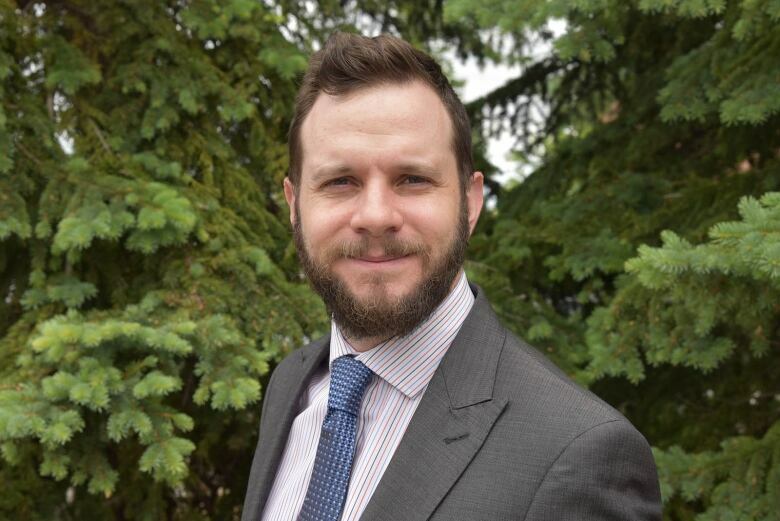 With local ticket-fighter Todd Dube of Wise Up Winnipeg bankrolling his legal fees, Aisaican-Chase says this challenge is not about the ticket. "I'm hoping that they'll adjust the red light time and give at least two seconds more on that 80-kilometre stretch for the safety of the public, because slamming on the brakes and not going into the intersection is so dangerous," he said. Lawyer Robert Zaparniuk, who will be representing Aisaican-Chase, said that this violation is what's called a "strict liability offence," meaning the only defence available is to demonstrate that reasonable actions were taken to avoid committing the offence. "The four-second amber in an 80-kilometre zone does not afford a person from the moment the light turns amber a reasonable amount of time to safely stop before the stop line," he said. Contrary to most jurisdictions in the country, Winnipeg uses a fixed four-second duration for its amber light, regardless of the posted road speed. Ontario and Saskatchewan both use adaptations of the standards laid out by the Institute of Transportation Engineers (ITE) and the national reference guide on traffic engineering endorsed by the Transportation Association of Canada. They outline a graduated scale where, generally speaking, greater speeds have longer amber intervals. As an example, in Edmonton an amber light lasts five seconds in an 80 km/h zone. Aisaican-Chase's defence team hired an Ontario forensic engineer to prepare a report on the signal timing for the Bishop-River intersection and to provide expert testimony. "Almost every jurisdiction in North America except for Winnipeg has identified the safety risk associated with short ambers and have then scaled them to match the driving behaviour of the people in the intersections in question," Darryl Schnarr of Roar Engineering told CBC News. "The [Institute of Transportation Engineers] recommends a deceleration rate of 10 feet per second squared, which converts to about one third of a [g-force]," he said. Schnarr said that four seconds is more generous than required at lower speeds. But based on the arguments he's seen from city officials, in order to justify their four-second interval at higher speeds, their traffic engineers accept a 12 feet-per-second-squared deceleration rate, which approaches half a gravitational force. "Stuff starts flying around your car at half a [gravitational force]," he said. "If you've got anything on your back dash, it's coming flying forward, if you have a drink in your cup holder it might spill." "If you think that 12 feet-per-second-squared is reasonable just for a yellow light, I would disagree with you," said Schnarr. The issue of amber light timing is not new to Winnipeg. In 2011, the city's traffic engineer, Luis Escobar, concluded in a report to council that four seconds was adequate for Winnipeg and was consistent with engineering practices. The city said it could not comment on the trial because it is currently before the courts, but a city spokesperson told CBC News that using a fixed four-second interval provides predictability for drivers. "Using a standardized duration time for amber lights provides predictability for motorists when they are making a decision about travelling across an intersection — it is one less thing a driver needs to think about when making a decision to enter the intersection," said communication officer Lisa Fraser. Darryl Schnarr said, however, that the goal for drivers should not be a consistent amber interval, but rather a consistent rate of deceleration. "What you're doing now is you're training people, 'if I'm going to be on Bishop Grandin and I see that yellow light, boy I better hit that brake as hard as I can,'" he said. The intersection at Bishop Grandin and River Road is consistently one of the most accident-prone in the city, with over 1,500 reported collisions between 2005 and 2014 according to figures released by MPI and the City of Winnipeg. Photo enforcement statistics published by the Winnipeg police shows the intersection also varies annually between the highest or second-highest generator of traffic tickets in the city. Wise Up Winnipeg founder Todd Dube has criticized the city for years about this. "The only crisis here [...] is the poor engineering that needs to be corrected. Otherwise, you'd have to believe that for some reason, people like to gather here to crash for some reason," he told CBC News earlier this year. 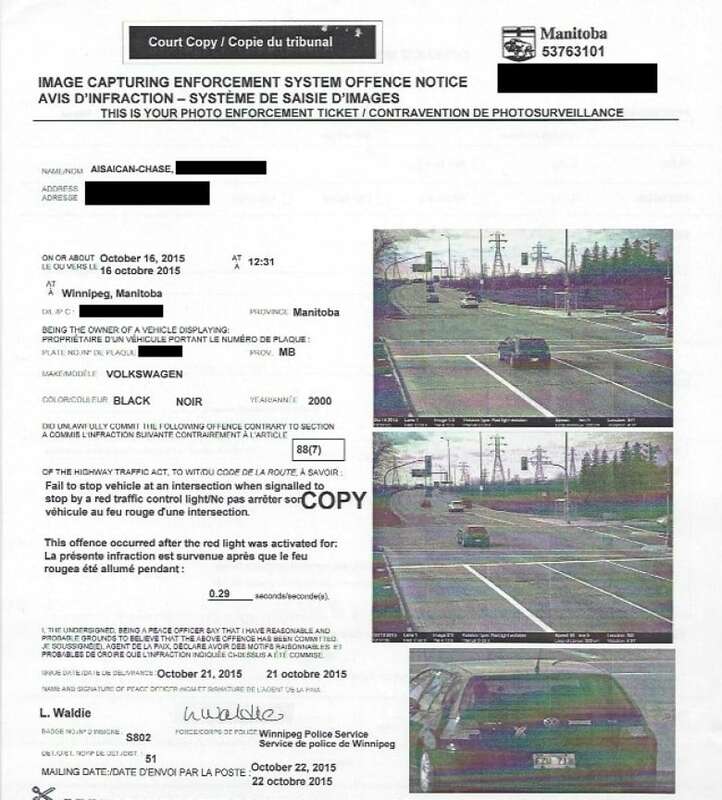 According to records released by Winnipeg police following a freedom of information request by Wise Up Winnipeg, nearly 42 per cent of tickets at Bishop and River in 2015 and 2016 were triggered in the first 0.25 seconds after the light turned red. Sixty-six per cent of them are issued by the 0.5 second mark. If amber lights lasted 5.2 seconds instead of 4, Schnarr says 90 per cent of red-light tickets would never be written. 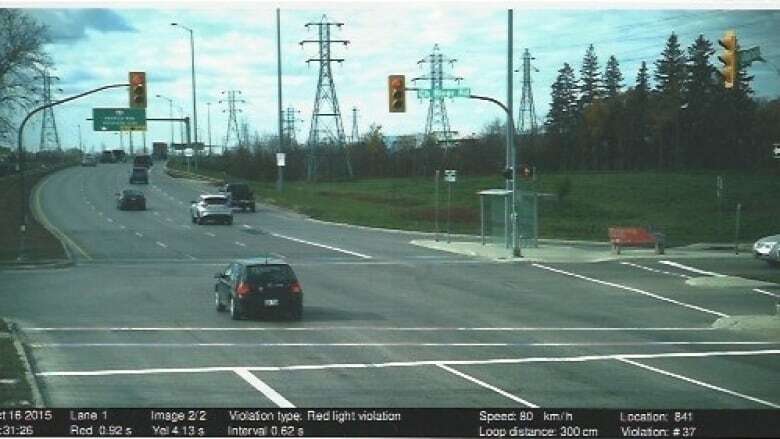 According to Schnarr, who prepared a report on behalf of the defence team, if red light violations were based on a yellow traffic signal duration of 5.2 seconds — as recommended by the ITE formula rather than 4.0 — over 90 per cent of these photo enforcement violations would not have occurred. The report also found that intersections in Winnipeg with 80 km/h speed limits issued 11 times more tickets than 50 km/h zones, which Schnarr believes is explained largely the "dilemma zone" phenomenon, when a driver is forced to choose between abruptly stopping or running the red light. The city says it is currently undertaking a review in light of the opening of the city's Transportation Management Centre and the opportunities that a fully connected signals system presents. The new system launched last January now connects all 650 of Winnipeg`s signalized intersections in a central management system. "Signal timing changes prepared by engineers can now be made within minutes by an operator in the [Transportation Management Centre]," said city spokesperson Lisa Fraser. Do you have a tip or more information about traffic engineering practices in Winnipeg? On your mobile device, click here to read Scharr's engineering report prepared for the case.